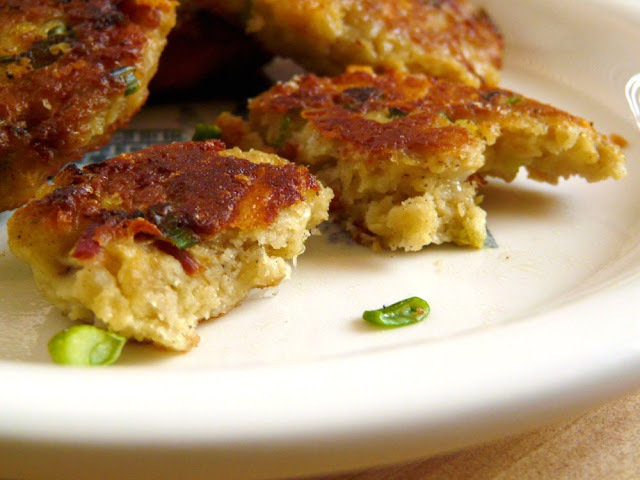 We had lots of mashies and stuffing left over so I turned them into savory pan fried cakes. I served them with a little ketchup and Sriracha but you could also serve them with a dollop of sour cream, Greek yogurt or leftover cranberry sauce. They made for a very filling and delicious lunch! Yields 8 to 9 little patties of each type. You can put whatever you want into these cakes. The important thing is to make sure sufficient egg and flour are added so that they will bind together and won't fall apart in the pan. 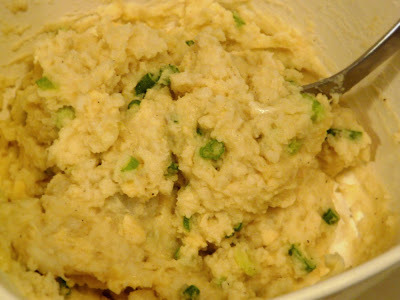 Mix the mashed potatoes, green onions, cheese, pepper and 1 beaten egg in a bowl. Add the flour to bind then form into small patties. Brown them on both sides until crisp. Heat about 1 cup of olive oil in a large frying pan. Dip the patties into the remaining beaten egg, then into the breadcrumbs and shallow fry over medium heat until browned on both sides. Drain on paper towels before serving. 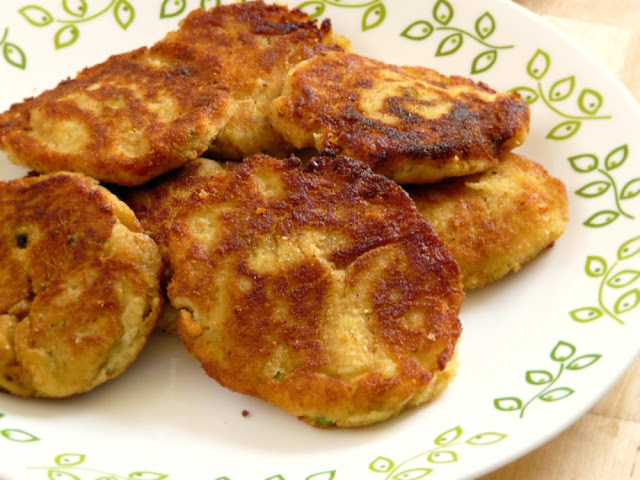 These are very similar to potato pancakes. 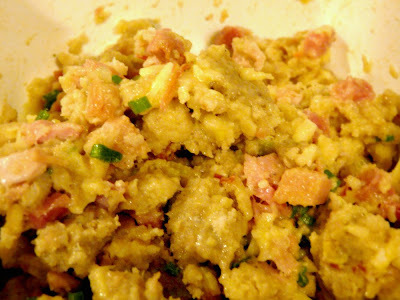 Mix the stuffing, green onions, cheese, pepper, diced ham and 1 beaten egg in a bowl. Add the flour to bind then form into small patties. 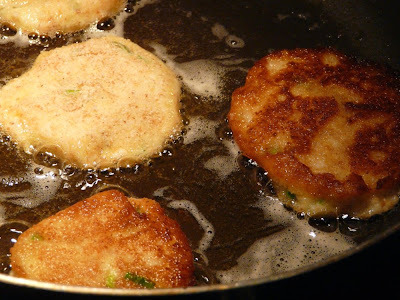 Repeat shallow frying method as written above but omit the process of dipping these patties into beaten egg and breadcrumbs. They hold together and crisp up just fine on their own. 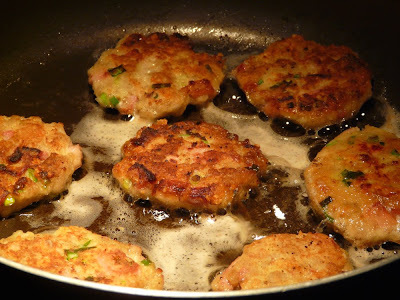 Stuffing cakes browning nicely in the pan. 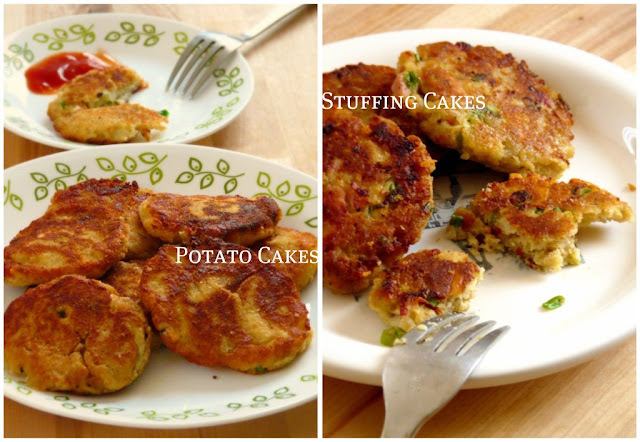 These stuffing cakes are really filling and would make a great snack too. I think this will go well with banana ketchup. Yum! I did try them with banana ketchup too and they were delish.